Kohei Uchimura of Japan won a record fifth straight all-around gold medal at the gymnastics world championships on Thursday in Nanning, China. Uchimura, who led every event except the pommel horse, sealed the title with 15.233 points on the horizontal bar to finish with a total of 91.965 points. Max Whitlock of Britain took silver with 90.473 points, and Yusuke Tanaka of Japan claimed bronze with 90.449. 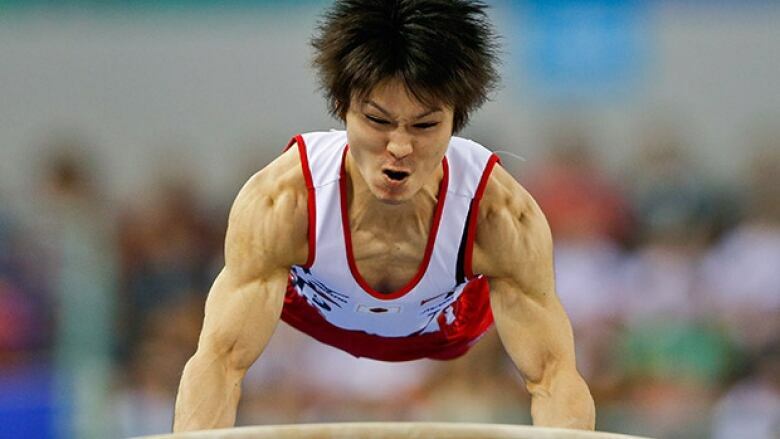 "Winning a gold medal for a fifth straight title is very satisfying," Uchimura said. "But I felt I could have been better on the parallel bar and the horizontal bar." Uchimura, who won the all-around gold medal at the London Olympics, was extra motivated to get the individual title following Japan's narrow loss to China in Tuesday's team final. "That was a tough loss," Uchimura said. "So I feel like today's result was not only a win for me but for all of Japan." The 25-year-old Uchimura has won every all-around title since the 2009 world championships in London. Oleg Verniaiev of Ukraine was fourth with 90.298 points, followed by David Belyaskiy of Russia with 89.765. Uchimura became the first gymnast, male or female, to win four world all-around titles last year in Antwerp, Belgium, breaking a tie with Svetlana Khorkina of Russia. The gold medal was Uchimura's seventh overall at a world championships, equalling the record for a Japanese gymnast. Eizo Kenmotsu and Akinori Nakayama also have seven. The Oct. 3-12 world championships continue Friday with the women's all-around finals where defending champion Simone Biles of the United States is the favourite.